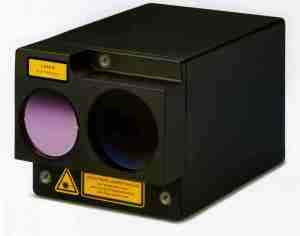 A laser range-finder is a device which uses a laser beam in order to determine the distance to a reflective object. The most common form of laser range-finder operates on the time of flight principle by sending a laser pulse in a narrow beam towards the object and measuring the time taken by the pulse to be reflected off the target and returned to the sender. Due to the high speed of light, this technique is not appropriate for high precision sub-millimeter measurements, where triangulation and other techniques are often used.